I’ve been in Jozi for nearly two years, during which time I’ve photographed the city skyline from countless different perspectives. (See some examples here, here, and here.) 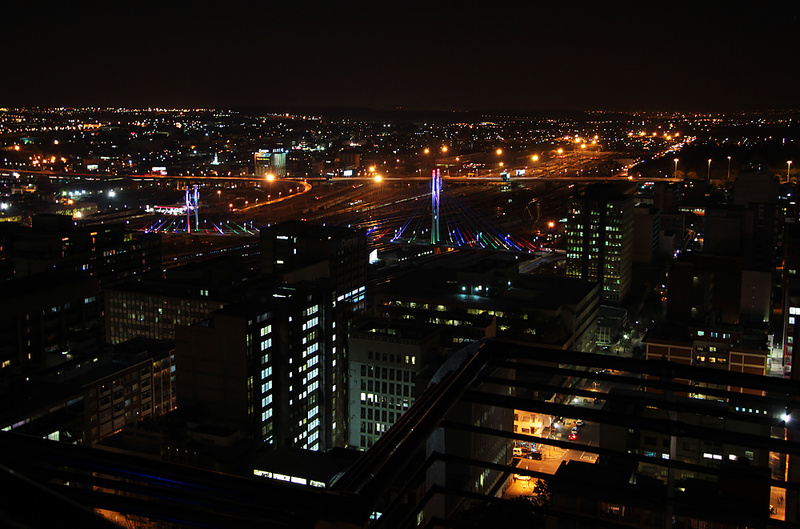 I’m afraid the 2Summers audience may start to tire of my Jozi skyline posts. I’ll hope you’ll hang in there for one more though. This weekend I was lucky enough to take photos from another spectacular vantage point. 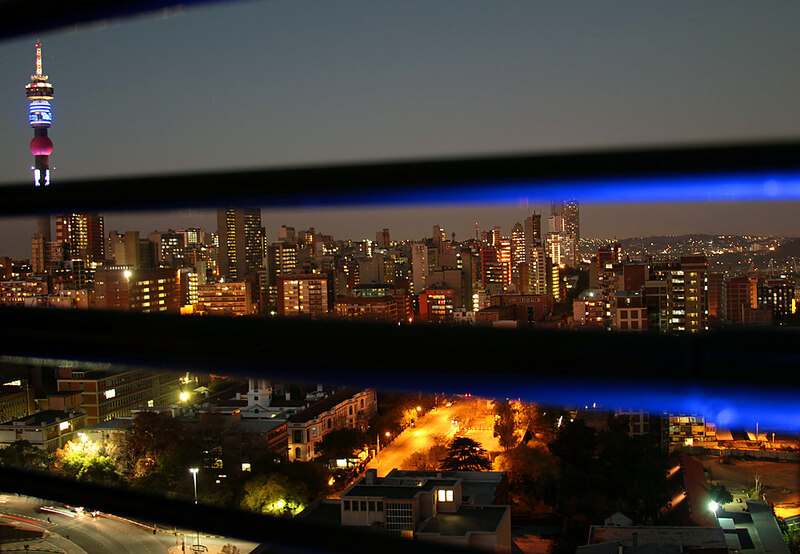 The 24th floor of the Parktonian Hotel, on the border of Braamfontein and Parktown. 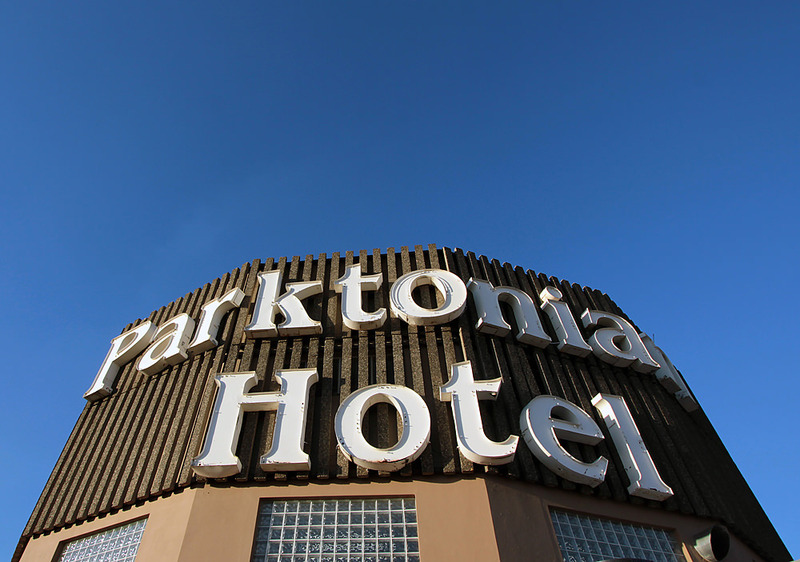 The Parktonian Hotel (despite the name, it’s located in Braamfontein), now part of the Protea hotel chain, stands out among the other buildings around it because of its rounded shape. I feel like there must be something historically notable about this building but I haven’t been able to find anything. I don’t even know when it was built. But history isn’t really important for the purposes of this post. 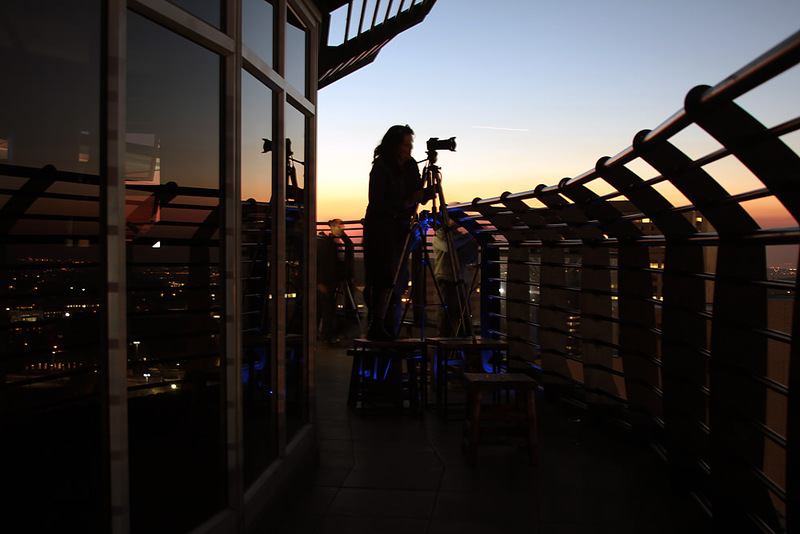 The only important fact is that the outdoor deck on the 24th floor of the Parktonian, which stretches all the way around the building, provides a 360-degree view of the city. 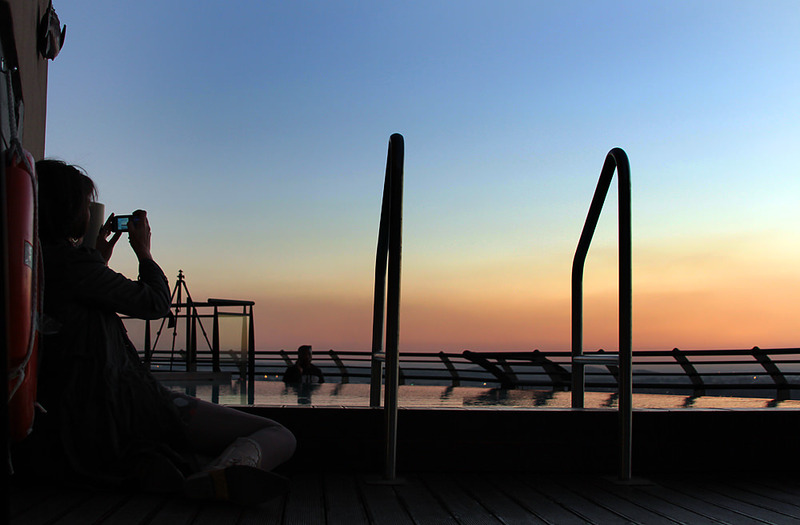 This deck is normally reserved for guests of the hotel, but I was able to check it out last Saturday when the Joburg Photowalkers secured the venue for an evening of sundowners and sunset photography. 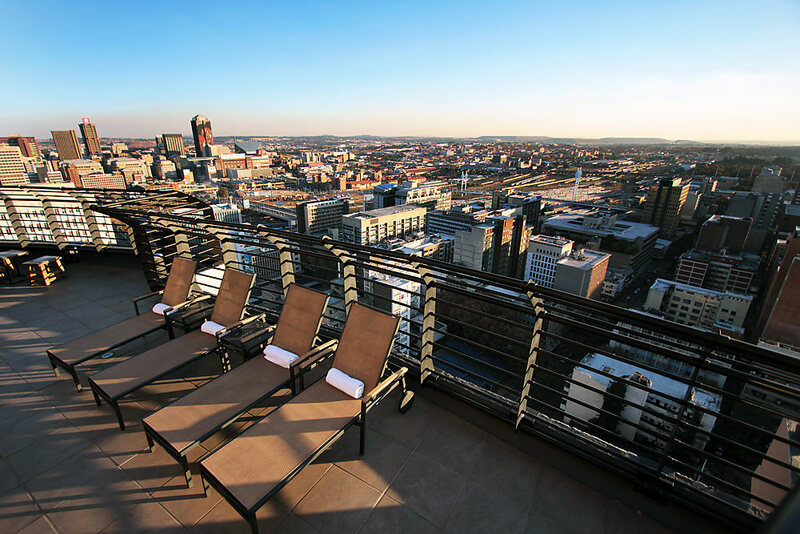 Deck chairs await guests on the 24th floor of the Parktonian, with the west side of the city in the distance. Shouldn’t the chairs be facing outward? Would you sit with your back to that view? View of the east side: The Telkom Tower surrounded by the highrises of Hillbrow. 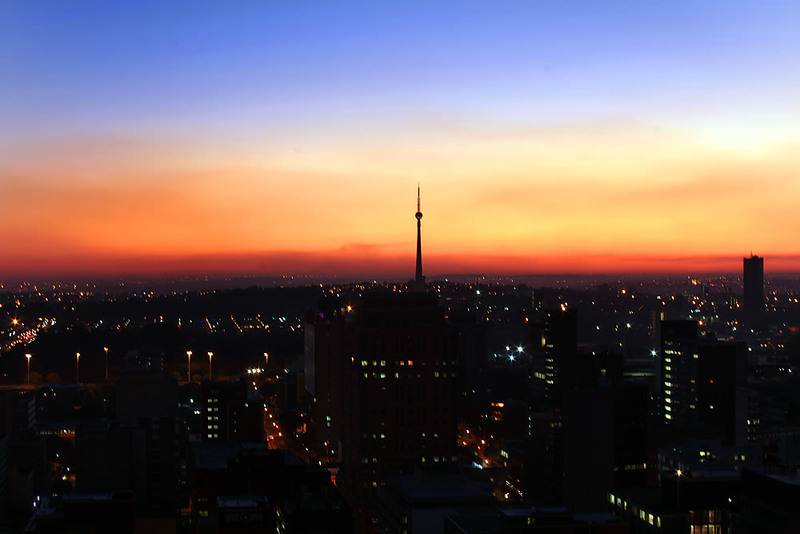 Along the skyline is a layer of pollution, caused mostly by woodsmoke — a classic sign of winter in Johannesburg. About 30 photowalkers arrived with cameras and tripods. We were also treated to a free happy hour — score! Complimentary wine and beer from 5:00-6:00 p.m.
Sunset from between the railings. Unfortunately, the combination of two glasses of wine and difficult shooting conditions did not do my photography any favors. The Parktonian deck is surrounded by a tall, closely spaced set of railings, and the only way to shoot above the railings was to balance my tripod precariously on a wooden bar table. I didn’t fare well with that arrangement. Once night fell, I hardly managed a single decent photo. The bars are actually kind of pretty from this angle, lit by the blue track lighting in the floor. In the end, I got better photos of my fellow photowalkers than I did of the view. Photos by the pool. Any old camera will do. 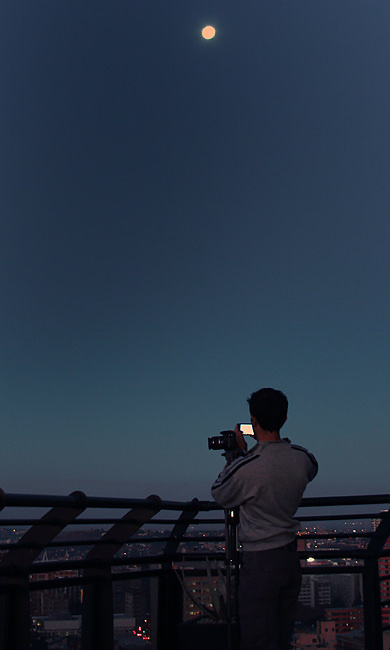 The moon was one day short of full. Photowalker Jackie demonstrates how it’s done. She arranged a trio of bar tables for her tripod. I tried her technique but my photos still came out blurry. I need one of those remote shutter release thingies. I did get one night shot of the city that I’m reasonably happy with. Nelson Mandela Bridge was sporting its multi-colored weekend look that night. Thanks to Seema Mathew, the Parktonian Hotel, and the rest of the Joburg Photowalkers for a great evening. wow, your work is beautiful and professional! so stellar my friend … I was looking over your should at one point at your LCD screen and wondering what I was doing wrong !!! Haha, I guess we all have our insecurities. I’ve been looking at everyone else’s pics on FB and thinking mine don’t compare! 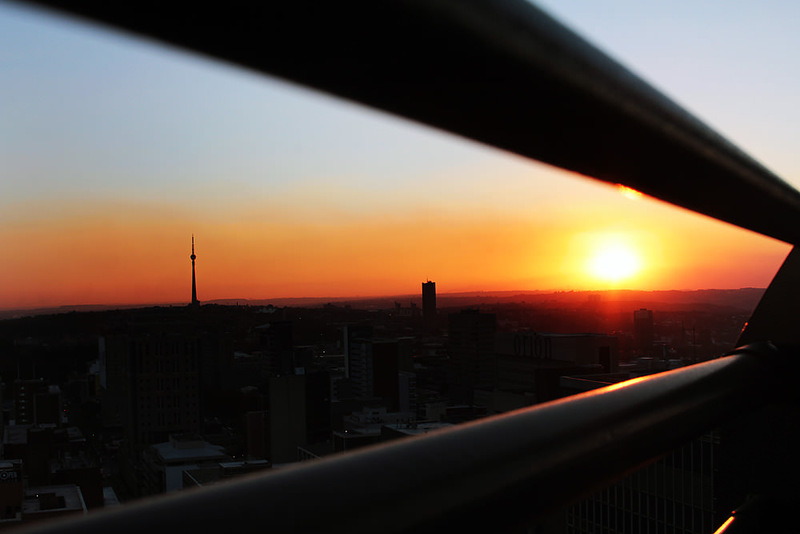 Sometimes I feel like all I ever do is photograph and share photos of Joburg (and SA sunsets) – but they never get old, and neither does looking at yours. That’s good to know, Kate. I never get sick of your pics either. I LOVE the sunset shot between the railings! I really, really love it! Your photowakers group always sounds so fun! My Sara would love their activities–as would I, for that matter. Fun post, Heather. 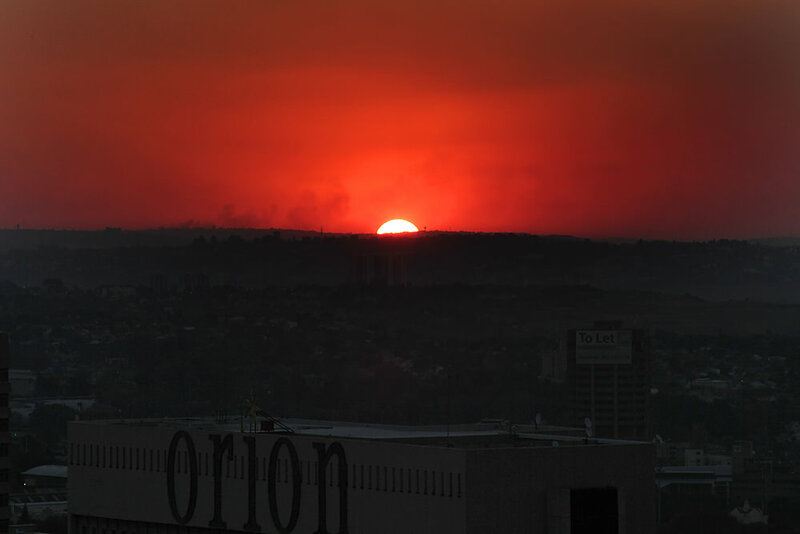 And, by the way, I will never tire of the Jozi skylike shots. bummed I didn’t make this. Have been to the Parktonian deck before, but never at night. The views are just awesome! Great pics and a wonderful post as per usual. There was nothing wrong with you night shots either. Thanks Chuck! This is the only problem with the photowalkers — you compare your pics to everyone else’s and never think your own are as good. Luckily most of my blog-readers don’t have the other photos to compare mine against. There was nothing wrong with you night shots either. but I am struggling to post this. Please send me some of your Melville pics. I’ll post them on my Melville post and crdit you if you don’t mind. Nice work Heather. I was ripped off in Cape Town for over $1000 Canadian. Warning to all people, change money in the bank and not on the street at a bank machine. The banks will not pay if someone steals your credit card on the street at a bank machine. They will not pay in Canada or South Africa, what a scam. Gosh banks and insurance are the worst!! Yes, I totally forgot about the self timer option. I need to try that next time.